Enjoy many relaxing hours lounging around the heated pool sipping cocktails, listening to the children’s delightful play, reading that long overdue novel and smelling dinner being prepared on the grill. This is your time for vacation and you deserve to spend it at the pace you prefer. For the full Florida Keys adventure, you will want to spend a day on the water fishing, diving, kayaking or paddle boarding right from your private dock. Here in Marathon, the temperate climate makes year-round outdoor living possible. Although “Get A Way Bay” interior decor will make being indoors equally as delightful. It is thoughtfully decorated within casual elegant beach house flair. Exquisite decor and quality characterize this luxurious Five bedroom pool home located in the quiet community of Coco Plum. Enter the glass entryway to the soaring two-story open foyer that leads to the custom curving natural wood staircase, or takes the private elevator to the main living area. 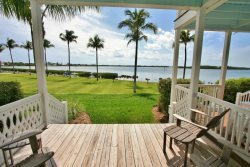 Plenty of room to spread out and relax with an open living room/dining area that leads to an enclosed Florida room overlooking the water. This room includes a game table and a separate seating area for your enjoyment. There is access to the pool stairs from the Florida room. The kitchen is highlighted by all new Kenmore Elite stainless steel appliances including a convection oven and a convenient breakfast bar. The main living level features a large master suite with a comfy love seat for reading and an in-suite bath. The split floor plan features two more bedrooms on the other side of the home. The waterfront bedroom has a king bed and a toddler bed as well as sliding doors that lead to the wrap around the walkway. The third bedroom has two twin beds and is conveniently located adjacent to the guest bath. There is also a full sized laundry room on this level. The entry-level features two more bedrooms and full bathrooms. Right off of the foyer is the bunk room with tropical furnishings including twin bunk beds, two sleeper sofas, and additional seating. There is a large flat screen TV that makes this a great place for the kids to watch a movie. There is a large full bath directly off of this room. Adjacent to the bunk room is bedroom five with a Queen bed, beautiful en-suite bath, and sliders that lead to the covered patio. Outside find a gorgeous freeform pool situated along the waterside with plenty of lounge space for your suntan with a covered patio that includes a large picnic table. This home is for the vacationer that accepts nothing but the best! All bedrooms feature TVs with cable. Docking - Deepwater docking, Limited one vessel per slip, 40' max length of the vessel. Parking - Plenty of parking for up to three vehicles and one trailer. Beach – Get A Way Bay is located just a five-minute walk from the natural beauty of Coco Plum Beach and only a ten-minute drive to Sombrero Beach. It was a very nice stay and home, we own a Real Estate company and understand the importance of good customer service, and Coco Plum Vacation rentals, was excellent. Perfect place to vacation. All of our needs were met. Thank you. Kelly was very responsive and came right over, after hours,when we asked for the towels. Couldn't have been better. When we return to the Keys again, we definitely will consider this property again. The property was very nice - it was perfect for our group of nine. Plenty of room for meal and still plenty of room to retreat.